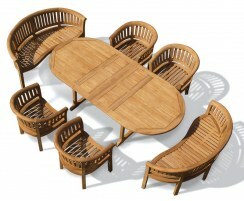 Our curvaceous Wimbledon teak dining sets will create a stunning focal point in any outdoor setting. Wonderfully robust and hardwearing, you can be sure your dining set will last you for many years to come. Browse the range today. Expertly constructed from the highest quality A-grade teak, these Wimbledon dining sets are extremely hardwearing and have been built to stand the test of time. 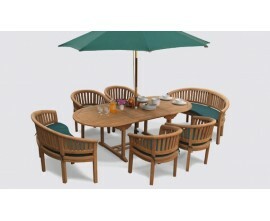 You can leave these dining sets outdoors all year round as they are weatherproof and rot-resistant. They will only require minimal maintenance, and can even be left untreated so they turn to a silvery-grey patina as they age.